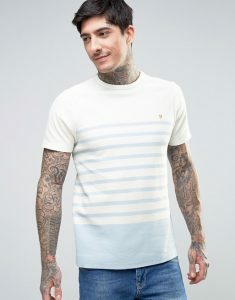 Farah is probably our fastest growing brand at Apache Menswear. In just five years it has built a loyal following among our customers, bringing them back season after season for Farah’s vintage take on modern menswear. Now that we’re in May, it is imperative to get your summer wardrobe spot on. So feast your eyes on these four superb Farah SS17 arrivals, and use the offer code NEWFARAH for 10% off at the checkout! 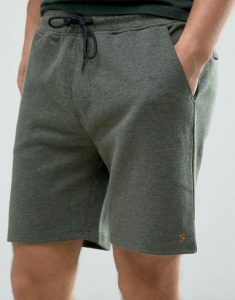 Sweat shorts are all about comfort, as Farah makes clear with this “Tarrant” short. The garment is made from a cotton-rich jersey fabric that wicks away moisture, making it ideal for summer wear. The elastic waist is designed with classic drawstrings, so that you can adjust the fit to exactly how you want. For security, Farah have included two zip back pockets, so you needn’t worry about valuables slipping out. Three superb colours are on offer in the Farah SS17 collection — Palm Marl (pictured), Yale Marl and Gravel Marl. 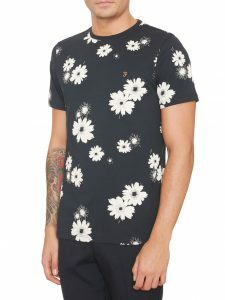 This new crew neck T Shirt has been a huge hit already in our Horsham store, and it’s easy to see why — customers immediately fall for the magnificent floral print design. The semi-slim fit is flattering without being too tight, and comes in a range of sizes to suit everyone (Small to XXL.) We’re expecting this T Shirt to sell quickly, so get down to our online store while you can. This T Shirt stands out from the Farah SS17 crowd with its glorious pique honeycomb cotton fabric. Soft to the touch, and a joy to wear, it will keep cool even in the most testing summer conditions. The light colour pattern really looks great paired with most vintage blue or light blue jeans. No summer wardrobe could be complete without a pair of quality chino shorts. 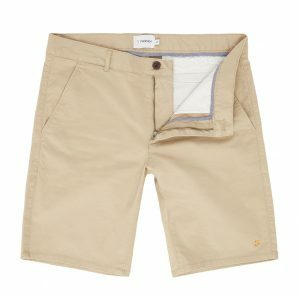 The key to this zip fly “Hawk” short by Farah is the use of a cotton twill stretch fabric, making it supremely comfortable in any leg position. The style naturally takes care of itself, with a classic Farah vintage design. We prefer the classic Light Sand colour — it goes with pretty much everything — but you can also wear these Farah SS17 chino shorts in Military Green and True Navy. Remember, you can save 10% on all new Farah SS17 clothing with our special offer code — NEWFARAH. Previous10% off new SS17 Replay Jeans!